And who do we have to blame for shattering our illusions of faux intimacy with our favorite celebrities? Each and every week, the good people who put together US Weekly try to hammer home the point that celebrities, despite their luxurious lifestyles and unfathomably large bank accounts, are just like us. And you know what? Until this very morning, we believed them. Thanks to glossy pictures on their glossy pages, we watched our favorite stars shop for groceries, we witnessed them picking up their clothes from the dry cleaner and yes, we even saw them blowing their noses! Witnessing the communal bond of humanity that we share with our nation's best and brightest inspired us to look up famous people like Barack Obama, Britney Spears, and 50 Cent on Twitter and to follow their accounts. However, thanks to a bombshell report in this morning's New York Times, we'll never be able to look at the likes of Barry, Brit Brit, and Curtis the same way again. You want to know why? Because each of these three people, *gasp*, employs ghostwriters to compose their Tweets! And who do we have to blame for shattering our illusions of faux intimacy with our favorite celebrities? As usual, freelance writers! Meet one Annie Colbert, a 26-year-old freelance writer from Chicago who ghost Tweets for some social-media guru named Guy Kawasaki. * Not only is she content with deceiving naive Twitter users like ourselves by composing carefully worded, 140-character messages on behalf of Mr. Kawasaki, but she's also threatening to spread her evil ways to other Twitter accounts! [Ms. Colbert] said she had been considering trying to get other ghost Twitter clients. "I don't think I could ghost Twitter for 100 people," she said. "More like 10 clients. I think I would have to get to know them." While we admire Colbert's plucky, can-do attitude during these challenging economic times, we find ourselves outraged that Chris Romero, the director of 50 Cent's web empire, so casually revealed himself as the wizard behind Curtis's curtain. "He doesn't actually use Twitter," Mr. Romero told the Times, "but the energy of it is all him." For shame! If you feel like your faith in humanity is close to being shattered, there is one famous person (just like us!) who stands as a shining beacon of transparent honesty atop Mount Twitter. 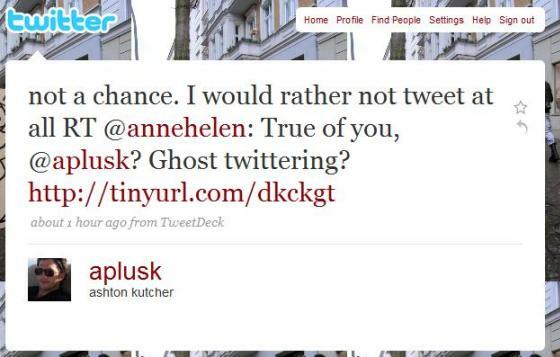 And that man, of course, is Ashton Kutcher. *Is it just us, or does that name sound like something that Jim Henson would've given to one of the Muppets?